My two blocks of marble are back together again. 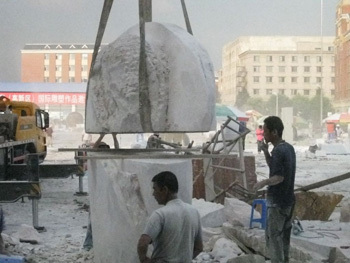 Many days ago the blocks were place one on top of the other so the overall form of the sculpture could be established. 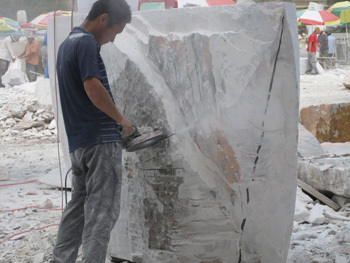 The blocks were then separated and carved while sitting on the ground, using angle grinders with diamond blade cutting discs, hammers and chisels. The main task facing us now the blocks are in their final position is to ensure that the key points on each block line up accurately. Of course there needs to be some minor adjustments. The artisans will follow the lines I have marked on the blocks with black ink and the design will flow seamlessly across the two blocks. It is quite exciting to see the the top block swung effortlessly into place on top of the lower block and nudged into place while suspended from a large mobile crane. The work site is not so densely filled as some of the stone sculptures have already been removed allowing space for some other sculptors to set up. The designs range from a giant parrot to abstract standing stones, a giant screw, as well as an ‘endless’ spiraling column of granite slabs, to ‘bells’ made from solid granite! Metal sculptures are also well advanced some fabricated from steel or stainless steel in a variety of geometric or free flowing shapes. A recent addition to the metal work shop is a 3 metre diametre steel sphere recently arrived from a factory in Beijing. The sculptor has drawn an intricate design of interconnected figures on the surface of the spheres. These shapes will be plasma cut turning this heavy metal object into an intriguing work filed with light. And many of the sculptors working inside an enormous hanger of a room have completed their works in clay. Plaster casts are then taken of each of the clay sculptures. 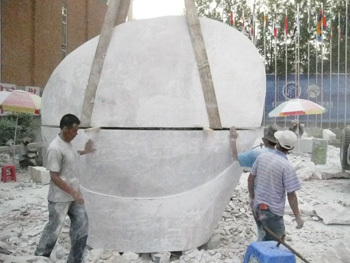 Fibre-glass is used to create a full scale replica of the original clay work. The fibre-glass replicas will then be spray painted to resemble bronze using a range of colours and patinas chosen by each sculptor. So there is never a dull moment. Always so much activity, so much to see and discuss, so much to observe and learn.